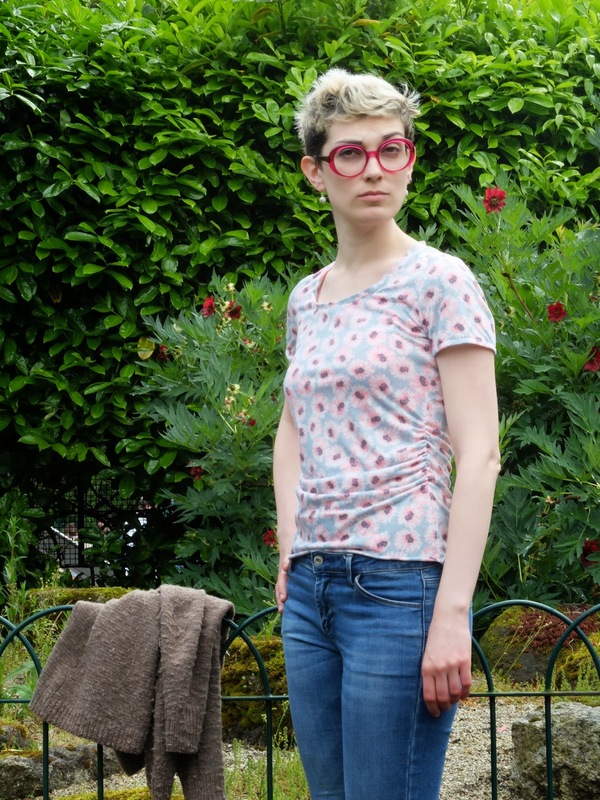 After more than one month off sewing I have finally finished this simple top from Style Arc. The first thing I did after moving to a new apartment in Dublin 10 days ago was to assemble my sewing corner. And although most of the things are still on the floor, I managed to find a bit of space to cut fabric for this pattern and sew it together. Ann T-top is one of the dozen Style Arc patterns which I ordered together with their Professional Pattern Club membership before leaving Japan. I loved making their patterns in the past: the Danni Dolman dress and Jessica dress were a real pleasure to work with. This top came as a free pattern with an order. I have to say that as much as the cutting and assembling process was easy and enjoyable, the general look of the t-shirt is not very flattering. The side ruching, described as hiding "a multitude of sins, has in fact created them. It made my abdominal area look weird and unattractive. Or have I already gained such a cute beer belly drinking Guinness? add length to the pattern. The top turned out to be so short that I did not even hem it which is fine because the fabric does not ravel. I should also re-read Gillian's Lazy tips for sewing with knits where she addresses many issues that may arise for "woven sewers" like me. P.S. Guys, I am finally settled! I want to scream out of joy! Even if I do not have a dedicated sewing room and even if Dublin is on average 10 degrees colder than any other place I lived, I have a home and, from now on, I can continue my sewing journey. And even if the moving company, which brought my boxes from London to Dublin, lost two of them with some of my sewing supplies, I am still happy because I will be able to travel to other places in Europe and not only replenish my stock but also meet with sewing community here. There are so many things I want to tell you about! More to come! I'm so glad that you are happier in Dublin! For your shirt, do you have enough width that you could resew the sideseams and cut the ruching right off? Or enough fabric that you could add a wide folded band at the bottom to make it longer? Those are both easy fixes! How cool are those glasses! They are awesome. So great that you are feeling settled. I agree about the ruching, you don't have any sins to cover up anyway so it seems a bit pointless! It's still a cute shirt though. I hope you are enjoying your new home in Dublin! I've never been in that beautiful city. I agree about the shirt, it is not very flattering. It seems the perfect pattern for a pregnant. Maybe with less fabric in the front side, it fits you better. Can´t wait to hear your news!!!! The top is cute, I like the fabric but yes, I must agree that even on the thin girl like you it doesn't look perfect with the side ruching. Strange idea, not thought through by the designer. Looking forward to all the news from you! I was totally distracted by the awesomeness that is your glasses that I didn't notice the draping on your tshirt! Now that you point it out though I think I agree. I have a pattern with a similar detail (DKNY Vogue 2091) but the ruching/ pleats are only on one side of the bodice & it looks a lot sleeker. I wonder if you could undo one side of the ruching on this, level out the hem & see how it looks? If you have never been here you should come! Dzięki, Joanna ;) I also think that the ruching was not well considered by Style Arc. When you read the reviews on this top most of people did not find it very flattering. Well, you learn from your mistakes as well. P.S. Have you got updates on your Japanese trip? On top of everything, I am getting Internet installed today! So not only will I blog more regularly, I will spend all my evenings reading blog posts which I missed for the last month. Now I am trying to find a healthy routine between office, friends and sewing (and taking Japanese classes). I don't find the rouching odd on you. And certainly it doesn't add to your belly (so you can go on drinking Guinness!). I am very happy you got settled. Look forward to hearing all other news! I'm so glad you're loving Dublin! It's about time that you have a happy home! Yay! I'm so happy for you! You seem to feel really at home in Dublin. Your tee looks great, but I see what you mean with the ruching and short length. I like making tees. Its so fast & a lot of fun :) hope to see u in Dublin at some point soon! Hurray to having home! Woo hoo! I have a new baby niece (and another on the way!) so I will definitely be coming to Dublin at some point! I really like the fabric you've used on the top, but I do agree about the ruching (then again, I'm not a fan of ruching at all). 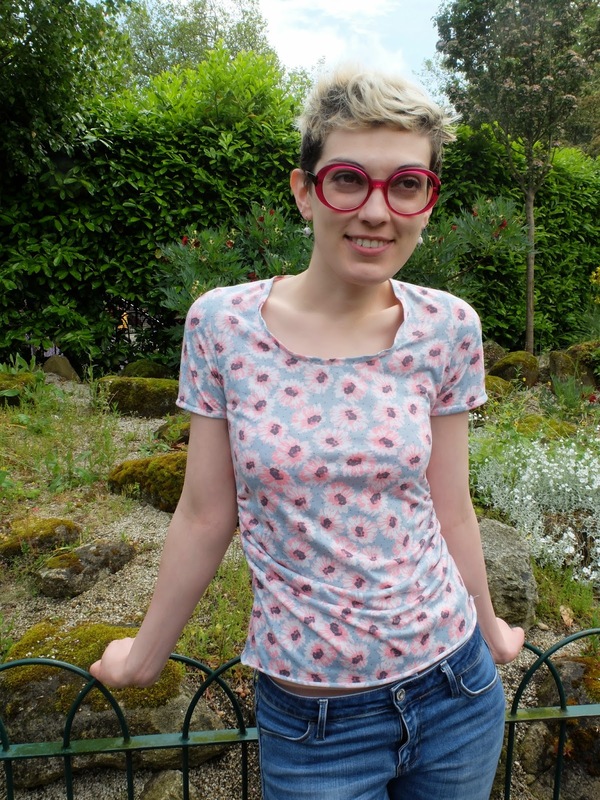 The neckline really suits you though as do your awesome glasses (Zoff?)! It's a shame you don't like the top as it looks fine in the photo. You could unpick the side seams and remove the ruching. You also should think about stabilising the neckline with interfacing tape on your next tee-shirt. It will sit flatter and last longer. and future. Exactly, why do Americans feel so inclined.